Squash fritters made with summer yellow squash and fresh garden chives. A perfect summer side dish to eat with chicken, meat or fish. My childhood BFF is visiting from Tennessee and she made me squash pancakes the other night with squash from her garden. Today I remade her recipe with fresh chives from my garden, and I added garlic and parmesan cheese and they were delicious. Any fresh herbs would work great in place of the chives. Add squash to a medium pot and cover with water. Bring to a boil and cover; cook until soft. When soft, drain; add to food processor and pulse a few times until chopped. Add 2 cups of squash to a medium bowl. 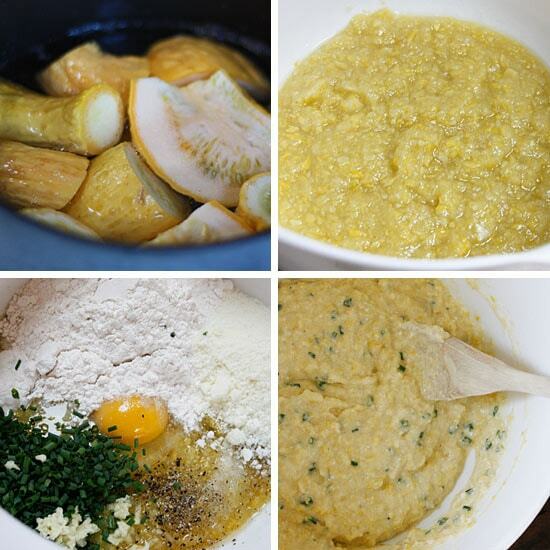 Combine squash with remaining ingredients except oil and mix well. Heat a large skillet on medium heat, when hot spray lightly with oil and reduce heat to medium-low. Drop 1/4 cupfuls of batter, slightly flattening them with the back of a spoon and cook a few minutes or until golden. Turn and cook the other side until golden. Set aside and repeat with the remaining batter. This may seem like a silly question but do you bake them first, then boil and then leave the skins on when you puree? There is no baking. Boil until soft then puree with skins on. You can find this in the directions if you scroll down a bit more. Does anyone have a clue about the total squash weight? I have some, ahem, baseball bat squashes that were hiding. I would like to use them without the bigger seeds. If this works out, I could save some cooked squash in the freezer for this winter. I like the idea of eating them with a poached or fried egg too! Well, I used a monster yellow squash from the garden, cooked it as directed, drained it, puréed it and drained it again. I think because it was such a monster, there was more water in it. I almost got three cups from that one squash. Because I have a ton of squash, I think I am going to process some more and freeze it in two cup quantities so I can make these this winter. I just wonder if scallions would taste as good as the chives. I also assumed that the garlic should be minced. I made this today with zucchini and cauliflower rice that I microwaved for 10 minuttes and then drained and squeezed a bit.Really really good recipe. Ooopps, I forgot to mention I substituted young zucchini instead of the yellow crook neck squash. Worked great! I made the recipe as written, except I didn’t cook the zucchini (I chunked it, then pulvarized it in the Vitamixer). Hopefully this did not change the fiber content. They turned out a beautiful green and were delicious and filling. I added a dot of sour cream to each (less than a teaspoon total). I would make again, however, my husband got the syrup out and was disappointed! Made these tonight with fresh squash from our garden. Did not have chives so substituted fresh basil instead. They were delish! Husband and son loved them too! Let me start by saying I am a HUGE Skinnytaste fan and I have made dozens of your recipes which have become staples in my house. I love your cookbooks, Facebook posts, etc. This recipe for me was so frustrating because no matter what I did I could not get the pancakes to cook in the middle! I currently have them in the oven to try to get them to cook! I tried spreading them super thin, cooking on low heat (which was taking 10+ minutes per side) but still they are uncooked in the middle. It sounds like others had this issue as well. Any thoughts on where I went wrong? Thank you for all of your amazing recipes! Roasted rather than boiled the squash. Doubled the garlic. Used 3 small summer and 1 zucchini cause that is what I had on hand from the garden. Enjoyed this, kids liked it. My son wanted to add sour cream. Will make again. These are the best thing ever! 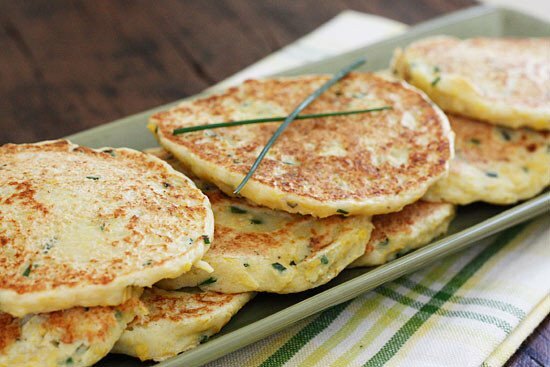 They taste like potato pancakes (with less guilt). I am delighted with this recipe. Thanks! These were delicious. I added a green onion and a scape to the chives and used different summer squash varieties and they turned out amazingly! I made these this evening and they wouldn’t stick together. They came out in crumbles ???? These were my supper tonight! They are sooooooo good! Thank you Gina! Great recipe. I made a huge batch and cooked them in the waffle iron. Then froze them and warm them up in the toaster as needed. Forgive me if this has been answered as I didn’t read through all of the comments. How do these compare to potato pancakes or latkes? What about using chopped okra in place of the squash? I do miss my fried okra. Made these with dinner tonight and they were amazing. I did have trouble getting the centers crispy but so delicious. Is it absolutely necessary to cook the squash first? Would it taste strange if I just grated it raw or chopped the raw squash finely in my food processor? Yikes, I'm out of eggs. Any suggestion on a substitution so we can try this tonight? This sound great! I understood they were kind of like fritters but maybe you should indeed add a /fritters to the name so there are no misunderstandings. I've been looking for a recipe for fritters cooked like they were pancakes for a while, but I've never seen yellow squash here in Portugal… maybe zucchini would work? Made these tonight, they were REALLY good! Thanks for all your wonderful recipes! I found your blog through pinterest and have been addicted to it ever since. I've made many of your recipes already (zucchini casserole just came out of the oven) and everything is wonderful. I'm trying to eat healthier and limit sugars and carbs. These sound so tasty and I would definitely have them for breakfast too! I'm trying to get away from eating all the sugary sweet junk for breakfasts. Veggies are so much better for you! Just wondering if you've ever made these with zucchini squash. We have it growing in our garden right now and I'm always looking for things to put it in. It just has such a high water content that I wasn't sure if it would work as well as yellow squash or not. These look tasty! Thank you! 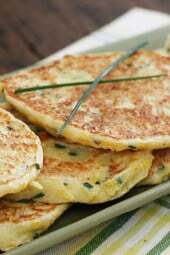 Just made these last night and used scallions instead of chives – they were wonderful! 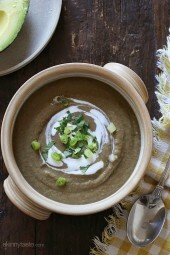 My 2 boys who absolutely HATE vegetables gobbled down 1 each – wonderful recipe! Would it be reasonable to pre-make the batter (say the evening before), refrigerate it, and then cook the next day? I'm sort of new to cooking and my time management of multiple involved dishes still leaves something to be desired. I was thinking that pre-making the batter could facilitate the process of putting a meal together. Unfortunately, I only have 1 small squash right now…how do you think this would turn out if I add some asparagus to fill in for the missing squash? Thanks! just made these for dinner tonight and they were DELICIOUS. i served them with a little smear of low fat sour cream and extra fresh chopped chives on top. thanks for the recipe! Oh, and thanks for having a "word verification" that I can actually see!!!!!! Kay, yellow squash maybe? Yes I used the entire thing, super easy! I would love to make these, but I have a question about the squash. From the pictures, it looks like you use the entire squash – skin and seeds? Also, is there a specific name of the squash that you use (other than summer squash). I'm so glad they were a success! Made these tonight as a side dish for some steaks we threw on the grill. They were incredibly delicious and a massive success. People had me printing out copies of the recipe to take home with them. Thanks for this! I came home from vacation and had 2 HUGE summer squash's growing in my garden, was so excited to try this recipe. Let me tell you, the first day they are delicious….the 2nd day leftovers are ever MORE delicious, I think the flavors are stronger the second day. I threw a couple in the toaster for lunch, with a tiny bit of butter, YUM!! I had to have more for a snack this afternoon so good! I made these tonight and they were delicious. I can't wait until I have more squash in the garden. I'm making these tomorrow night along with your crockpot santa fe chicken. They look delicious! 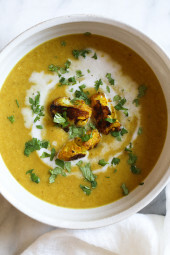 I also have tons of summer squash in my garden and this recipe is perfect for using them up. I made these with grilled chicken for dinner tonight and they were really tasty. Thank you for all the great recipes, Gina! These were tasty, whatever you call them! We had them with BBQ ribs tonight and they were a great way to use up my summer squash from my garden. My two-year-old, husband, and I all ate them up! These could also be called blinis if made into smaller appetizer sizes. Top the blinis with sauteed lobster meat, sauteed in a very small amount of butter with fresh garlic and shallots. Then season with some salt and pepper. Serve with a very small dollop of low fat sour cream on the side of the plate (I like to use 0 fat Greek yogurt for 0 points in place of sour cream), then add the sauteed lobster to the top of each blini and serve as an appetizer. 1/2 cup of lobster is 2 points. You only need a few small pieces for each small pancake. I would estimate that the buttered lobster, if only using small pieces per blini would add an extra 2 points, at the very most. With the pancake size reduced to half its size for an appetizer portion, you would have a 3, possibly 4 point appetizer. I know it's a splurge, but for a special occasion it would be fun….and worth it….if you like lobster, like I do! 🙂 You would have to calculate just how much butter and lobster you put on each blini to get exact point count. I am just estimating….. I can eat 3 pancakes for well under 200 calories?! I'm IN! Made these the past two nights for dinner. They were the best thing that I have made in a long time. A-MAZE-ING! However, my came out pretty soft in the middle. They were still good but I am wondering if I did something wrong or if they are supposed to be that way. Not enough flour? Not squishing them flat enough? To the person who got different results in recipe builder, not sure why. I just checked and got the same results. Brilliant turning these into muffins!! I like the butternut and sage suggestion, that sounds great. I just made these for the third time. The first two times I decided to fill in the bottoms of muffin tins because I had the oven on – they came out great! The second time I ended up with more batter somehow and so I put more batter into each of the 12 muffin tins and it wasn't as good as the first time around. For the third attempt I ran out of squash and used mostly zucchini – I didn't read the comments until afterwards and therefore did not add any additional moisture. I just tasted one and they are good – nice and crunchy. I'd like to serve them as an appetizer with some kind of sauce. I'm thinking sour cream and chives – but if anyone has suggetions I'd love to hear them! Thanks again Gina! I was excited to see this recipe–and enjoyed it thoroughly as a side to grilled BBQ chicken. Gina, I ran the ingredients through the WW recipe builder and got double the PointsPlus value. Did you already calculate it? My only modification was adding a teaspoon of olive oil. I'm math-challenged so don't take it personal! Thanks! Oh my goodness! Made these today and my daughter and I loved them!! Thanks for all your great recipes! We call them squash patties in our TN house :). And they are to die for!!! We do it a little different, but very similar to your recipe. LOVE this variation and can't wait to try these! Thanks Bella! I don't see why not, would change the taste but the texture would be the same. I bet that would be good with sage! Love your site!!!!!!!!!!! Has helped being on WW and still being able to be a Foodie!! Thanks so much! Question…do you think you could use Butternut squash?? OMG!!! I made these!!! With a few adjustments (used gluten free bisquick (deleted baking soda), didn't have chives, used two cloves of garlic instead of one, and added 1/8 tsp of minced onion flakes, oregano and italian seasoning). I grew up eating "potato patties" from left over mash potatos, so this is what the recipe reminded me of, HOWEVER! these are so amazing they blow those out of the water. I immediately called my mom and told her she had to make these; in addition, my husband and 4 year old son (who was the sous chef) ate LOVED LOVED them! Thank you. Cindy! I had these with dinner tonight!! They were so amazing! Glad to hear that Karen! I'm not sure how this would turn out with mushrooms, you could always use less flour. Made these last night, and my boyfriend, who isn't really a "foodie" like I am, was ranting and raving about these – they were awesome! I think this would make a fabulous breakfast food as well, although this time, we had it with baked chicken for dinner – thank you! I have not tried this recipe but made some waffles using bisquick mix and putting shredded zucchini and parmesian cheese along with the rest of the ingredients and they turned out really good… We loved those.. This sounds like it would be good also.. I made these tonight… oh my yum! Thanks! These look delicious! Kind of similar to the cauliflower fritters (which were great). I'm wondering though, I recently found out that I can no longer have dairy. Can you recommend a good substitute for the parmesan in this recipe? And perhaps ways to substitute for dairy in other recipes in general? Thanks! These look fantastic!! Since I'm gluten free, do you think corn meal would work in place of the flour? Hmm, I don't have summer squash, but I do have tons of zucchini growing the the garden! I'm going to try this out with zucchini and see how it goes! I hope I get squash from my CSA this week so I can make all these yummy recipes! Those look delicious! I just got a ton of squash from my dad's garden too! Have you ever tried to freeze them? I was wondering if that would work or if it would mess up the texture. Just do a print preview, and look to see which pages the actual recipe is on. X out of that window and then go back to regular print button and choose only that page or pages. Could I use cauliflower instead of squash? I just bought a ton yesterday! Thank you! These sound wonderful! Summer squash is such a nice flavour in baking and things like this. Yum! Wow, Gina I have booked marked your site for months now and check on it everyday. Your pictures are so fresh and they're exactly the homey and satisfying type of food that I recommend to my clients! (my clients also LOVE your site) I had a previous blog trying to do what you did, but to epic fail. Keep up the amazing work, you're inspirational. There is a print button at the end of the recipe, right under the words Makes 12. These sound delicious! 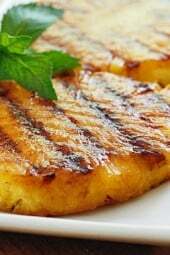 Could you grill the yellow squash, then puree it? What a wonderful use of fresh summer produce. I cannot wait to try these! I have not been able to get past the texture of squash. But this looks amazing! It looks like a solution to my problem, I bet these are delicious! I love savory pancakes. Yumm, awesome recipe. 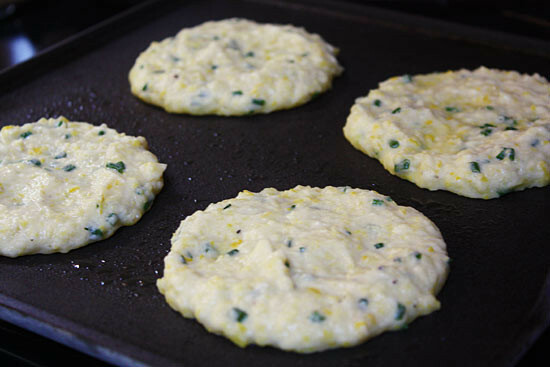 Savory pancakes are so good, and what a fantastic use for the prolific summer squashes! They look delicious and I can't wait to try these! Sounds great! My grandsons are visiting this week and I got the oldest to eat grilled squash last night, youngest tried but wouldn't eat it. He might like these. Thanks! Yes, I suppose you could eat them for breakfast! And yes, you could use zucchini instead. If you use raw zucchini, you probably need to add some liquid. I do have a recipe for zucchini pancakes so you should probably use that recipe instead. Aww I am so glad you posted this. One of my Aunts use to make these all the time. I never got the recipe from her. They were always on the family dinner table and the went FAST!! Thank you! My husband prefers yellow squash to (green) zucchini, but most summer squash recipes use zucchini. I'm sure I could just sub out, but I appreciate finding a recipe that uses yellow squash. And while I recognize that these are savory side dish, I would eat them for breakfast, with a couple of poached eggs. Yum. Oh, I would totally eat these for breakfast (or dinner or as a side dish)! Corliss – I make a type of pancake similar to this with shredded squash (similar to potato pancakes) so I don't see why you couldn't add shredded squash to the batter. It would change the texture a bit but not necessarily in a bad way (at least not in my mind). I wonder if you might have to add a little liquid to the batter…..
Oh! Thanks so much for the squash recipes – I am overrun with them! Please keep them coming. Can't wait to try these today! I think I will make to go with some sort of sausage and rice dish. I immediately recognized this as a side dish and am anxious to try as I have been avoiding the syrupy breakfast pancakes….too many calories, etc. This, on the other hand, I consider guilt-free since it is full of vegetable goodness! I will probably use King Arthur's Unbleached White Whole Wheat Flour. Thanks, Gina! That really sounds fabulous! I am not a fan of sweet pancakes but this one with squash and Parmesan sounds delicious to me!! We grew up eating these. They are also good with cauliflower or zucchini or even with chopped bits of squash blossoms. My mother called them patties instead of pancakes. I don't have a food processor, could I just shred the raw squash and add it to the batter? These look tasty!!!! I'll have to give them a whirl! A fantastic idea – I'd love to serve these with our bbq pulled pork, or other grilled veggies. Yum! Hmm, these are more if a side dish, I don't think I would have them for breakfast. Perhaps I should have named them fritters. I eat potatoe pancakes for dinner with sausage. So, I think pancakes is fine. And I would not rule them out for breakfast. Would be a tasty alternative to hashbrowns. No syrup needed. sounds great to me. can't find enough uses for my chives. These look great! I love your note above about how they're more like fritters – such a different breakfast for me and definitely want to try. Thanks for another great recipe! No no, these are savory. Not sweet, they are basically fritters without the deep fried oil. These sound great, Gina! Any ideas on how to make them dairy free? Do you think they would be good with gluten free flower (maybe oat or almond) and no cheese? Any ideas on what I should add to alter the recipe. Love the idea! I'm not going to lie…itdoent sound tasty, BUT I love everything on your site so I will try it! Do you put syrup on it? ?